2. How do trees respondent to variations in climate? 3. What role do forests play in carbon sequestration? 8. Quelles perspectives pour le suivi des forêts ? What impacts does atmospheric pollution have on forests? Is acidification still a threat? Will forests be able to adapt to global warming, or even help to attenuate its effects? How is forest biodiversity changing? For several decades, foresters have been showing concern about what the future has in store for these ecosystems, a concern of import to society as a whole. Careful monitoring of these ecosystems to detect, understand and, if possible, anticipate how changing environmental conditions are affecting them is necessary if we are to successfully implement sustainable forest management practices. 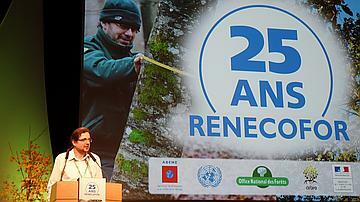 In 2017, the RENECOFOR network celebrated its 25th anniversary. The colloquium organized for the occasion was an opportunity to review the Network's results, recognize the contributions of the various actors involved and discuss future perspectives. The colloquium took place from October 11 to 13, 2017, at the Beaune Conference Center (Beaune, France). 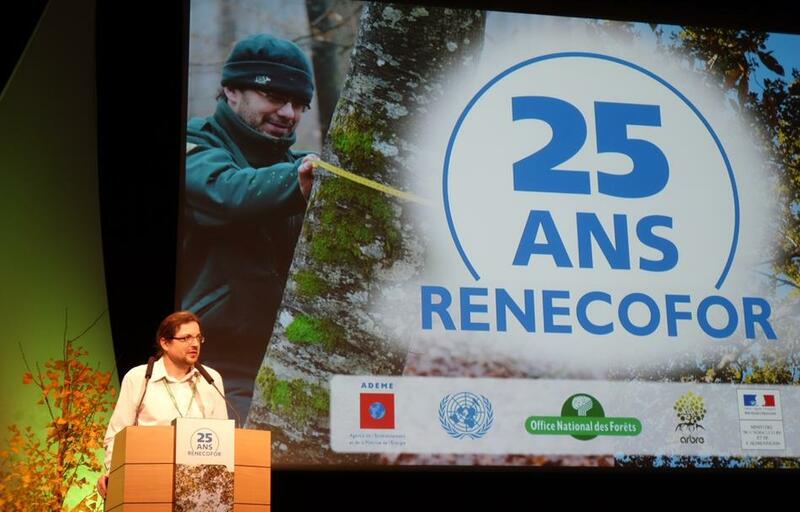 More than 300 participants attended including ONF personnel, private forest managers, researchers from France and other countries, teachers, students, institutional representatives, business representatives and journalists. Detecting changes in forest ecosystems, modelling and predicting how forest functions will evolve in the future, assessing tele-detection tools, etc. Considerable progress in many domains has been made thanks to data collected by RENECOFOR, either independently or in conjunction with other French or European monitoring systems. These results confirm the on-going pertinence of the RENECOFOR monitoring effort, initiated in 1992. The colloquium was also an opportunity to reflect on the future role of forest monitoring. Indeed, at the outset, the RENECOFOR programme was to last for only 30 years; in terms of the forest life cycle, such a time scale is too short. In view of the challenges global climatic changes and the emergence of a "green" economy promise, the colloquium brought decision-makers and scientists back together to define a more long-term monitoring strategy. Finally, exhibits and poster presentations broadened the scope of the colloquium and stimulated exchange among all the participants.